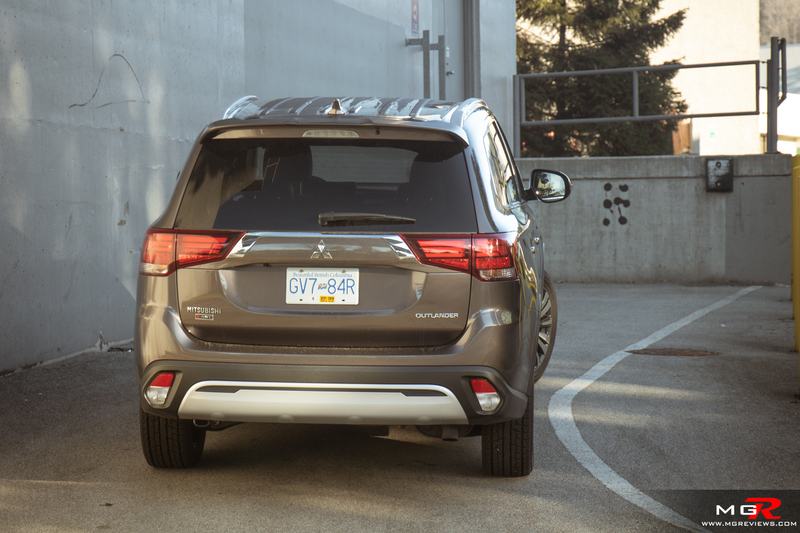 The Mitsubishi Outlander is the “old dog” in the company’s lineup as it’s been around since 2003 making it the oldest SUV that the company produces. In that time it has gone through two previous generations to arrive where we are today at the third generation. In the three-row SUV market, it is one of the least expensive options but how does it compare to the competition? 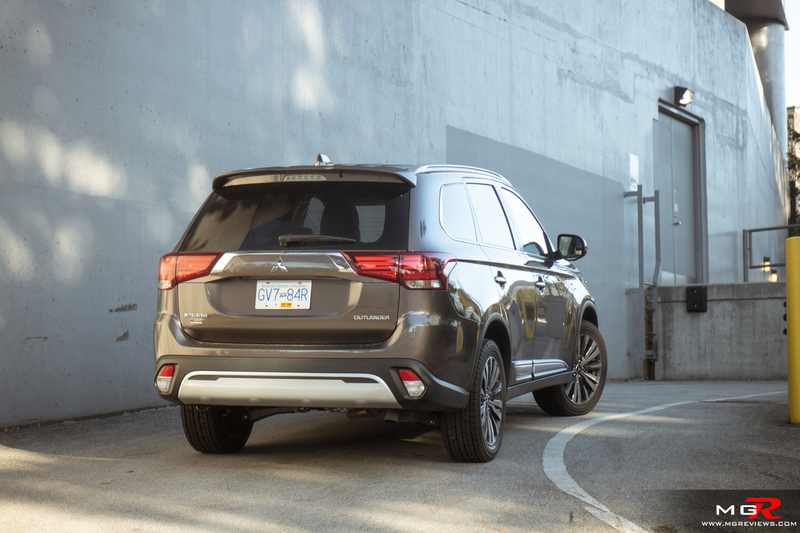 Engine – The base engine that is available with the Outlander is a 2.4L with just 166hp and 162 lb-ft of torque. Very low numbers for an SUV which is why you should consider this GT trim with the 3.0L V6. 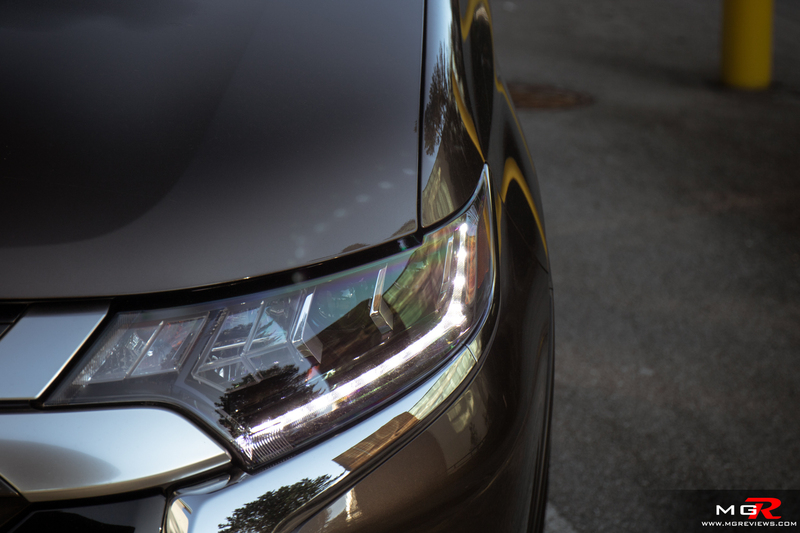 It produces 224 hp and 215 lb-ft of torque. 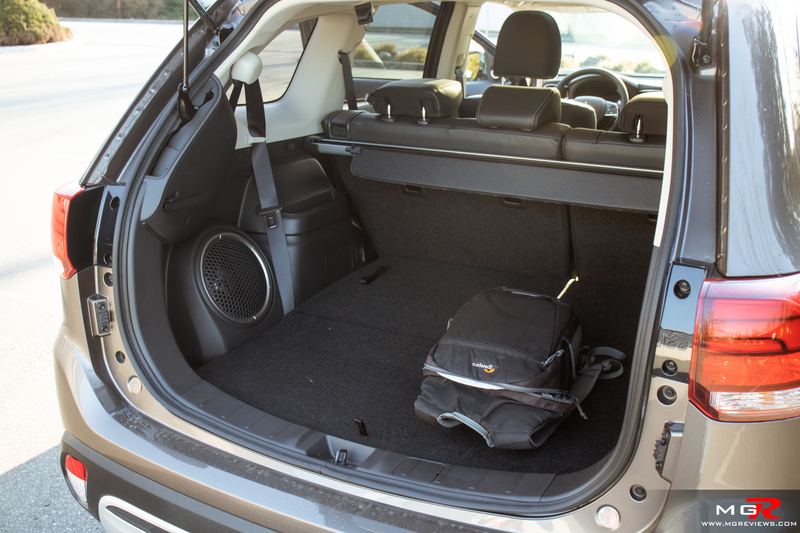 A better power output for an SUV that tips the scales at just over 1,600 kg (3,600 lbs). 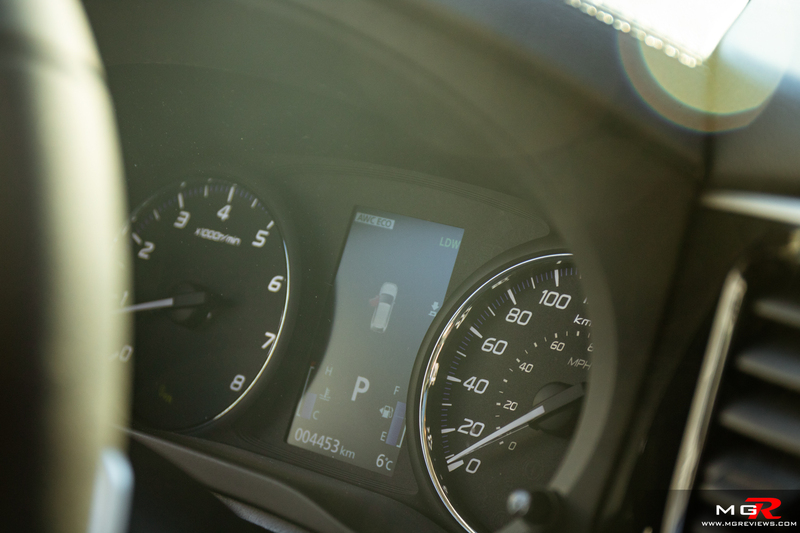 This 3.0L V6 doesn’t quite have the same immediacy as the 2.5L turbo four in the Mazda CX-9 or the silky smoothness of the 3.5L V6 in the Honda Pilot. But it is more fuel efficient than both at 12.0 L/100km (19.6 mpg) in a city and 8.8 L/100km (26.7 mpg) on a highway. On top of that, it can still tow 1,588 kg (3,500 lbs) just like the other two despite having a less powerful engine. Transmission – The 3.0L V6 is paired with a 6-speed automatic transmission. 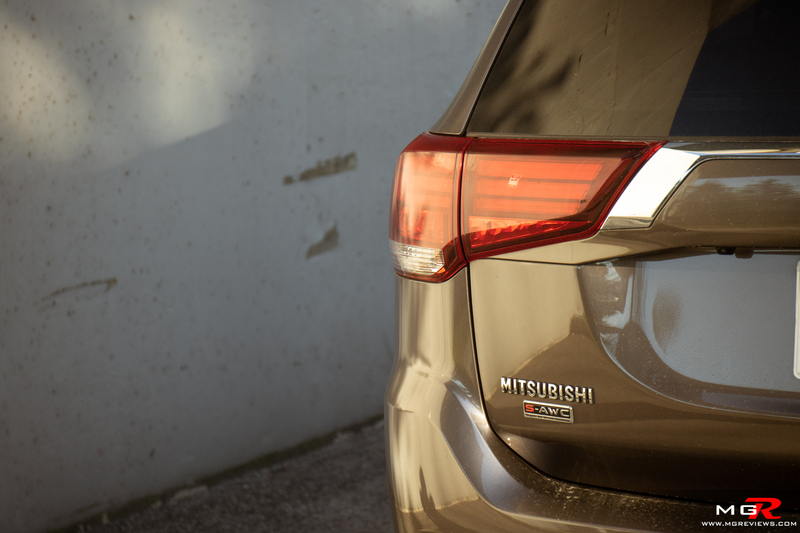 Surprisingly not a CVT as other Mitsubishi models currently have. 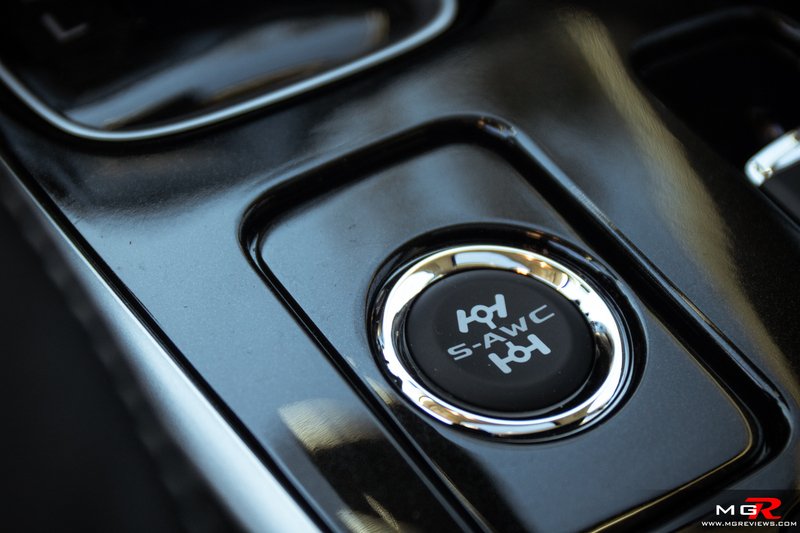 Under normal driving conditions, shifts are smooth and the transmission doesn’t do anything out of the ordinary. 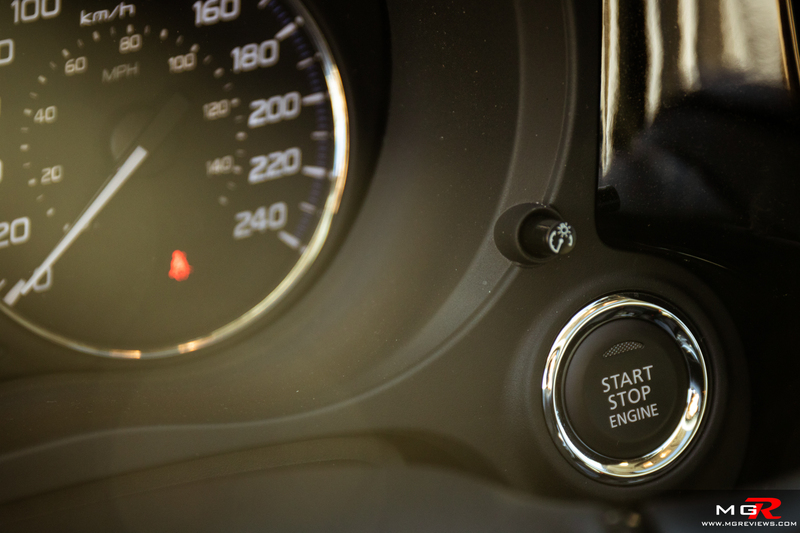 Using the column mounted paddles however can be frustrating as there is a big delay from the time you pull on a paddle to upshift or downshift, to the time the transmission actually does what you ask of it. 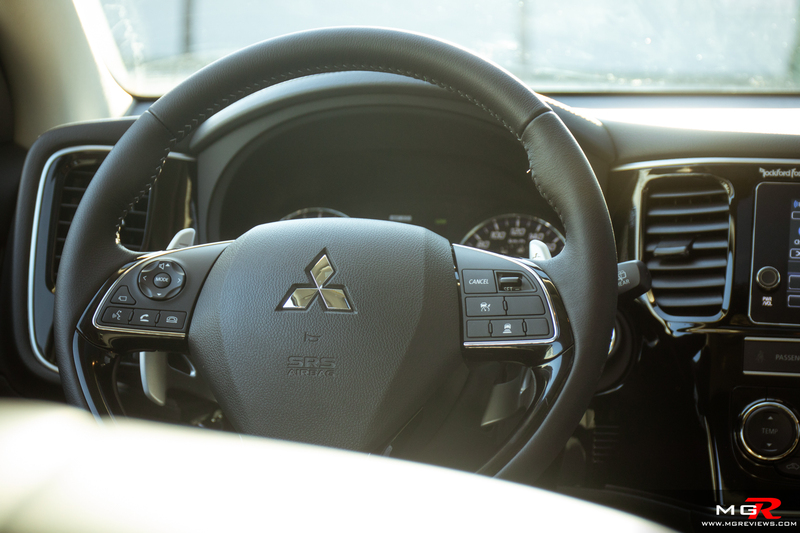 I think Mitsubishi should have just left these paddles on the twin-clutch SST that was found in the Lancer Evolution. 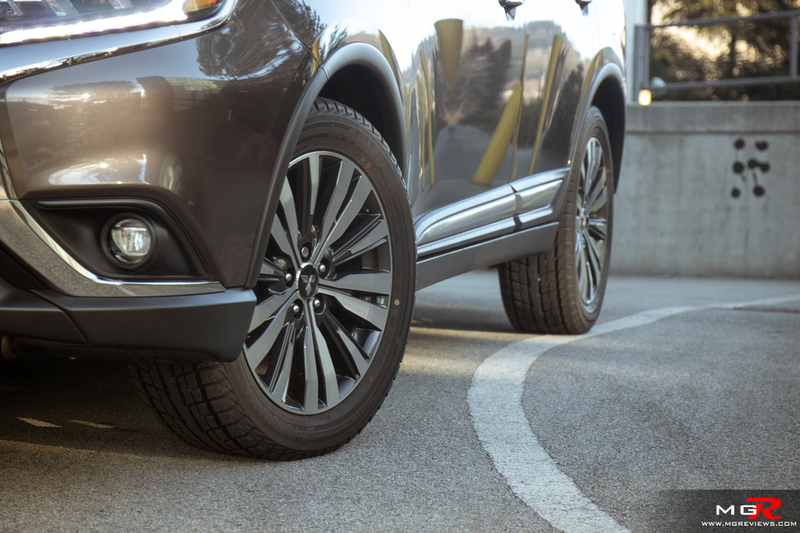 Braking – The brakes on the Mitsubishi Outlander have a good bite which in turn means less pedal effort is required to bring the SUV to a stop in normal driving conditions. The pedal though is a little soft and doesn’t provide a whole lot of feedback when pressing it harder. 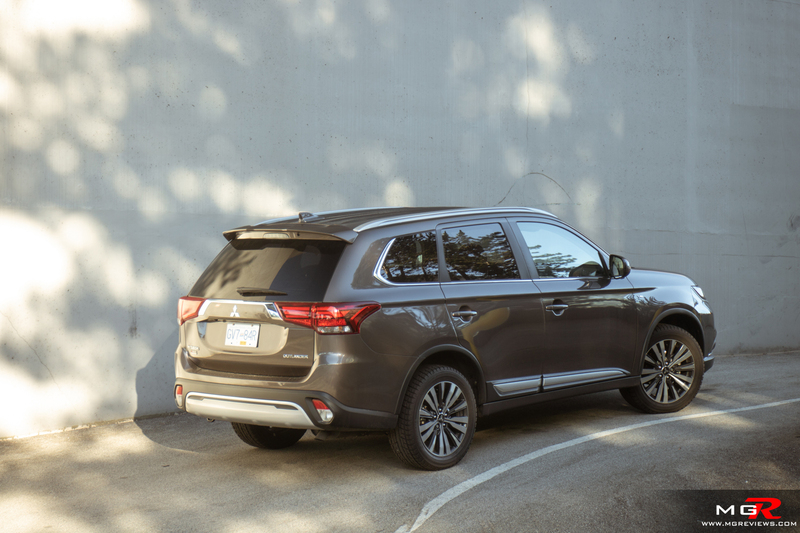 Handling – The Outlander GT is by no means a sporty 3-row SUV like the Mazda CX-9. It is more suited for daily commutes in a busy city with potholed streets. The suspension is better tuned to absorb bumps rather than providing steering feel around a twisty mountain road. This GT trim with the 3.0L V6 is also equipped with Mitsubishi’s S-AWC all-wheel-drive system which can not only transfer power to the rear wheels but also from side to side depending on which wheel has more traction. Ride Comfort – As mentioned earlier, the suspension is tuned to provide more comfort than outright speed around a corner. 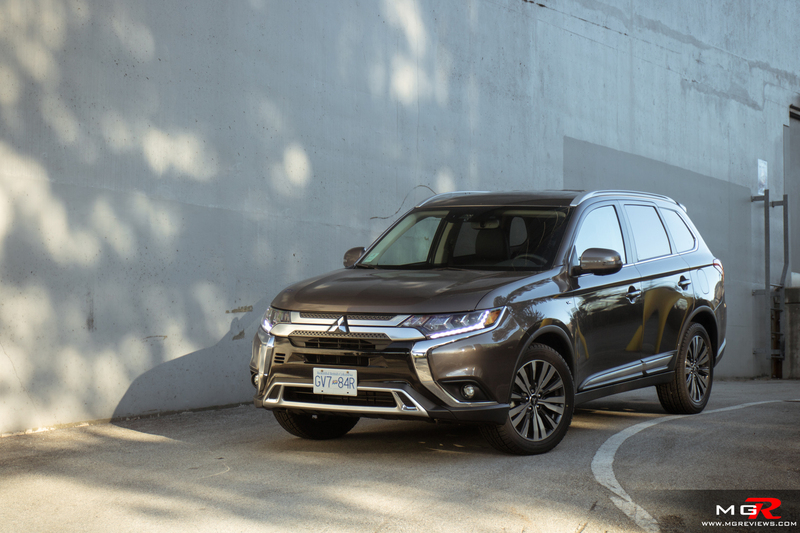 As a result, the Mitsubishi Outlander is one of the more comfortable three-row SUVs on the market even when the roads get very rough. Interior Space – Front occupants have a good amount of space and sit high up for a commanding view of the road ahead. The second row seats are ok for normal sized adults but taller adults will have to recline the seats back for a bit of extra headroom. The third row seats are tight, even for children. 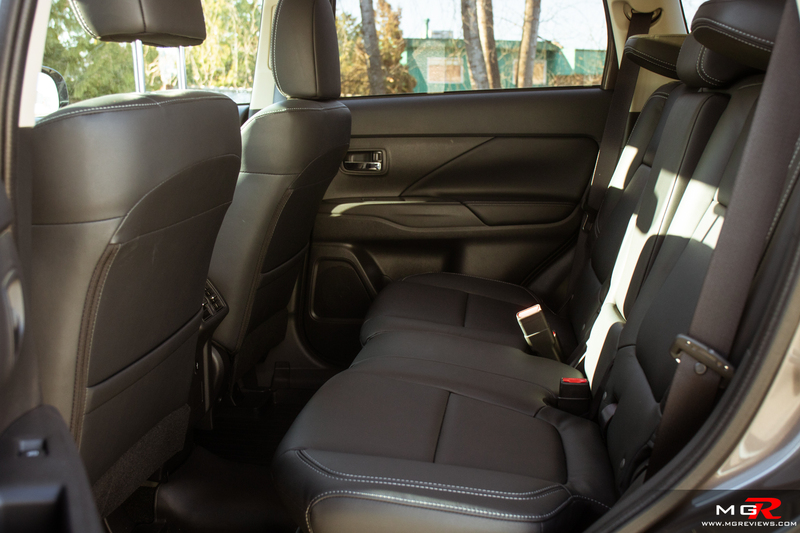 Depending on your frame, the seats can be comfortable or you will be struggling to find a comfortable position. I personally found the front seats to be comfortable but others that have tried them didn’t. 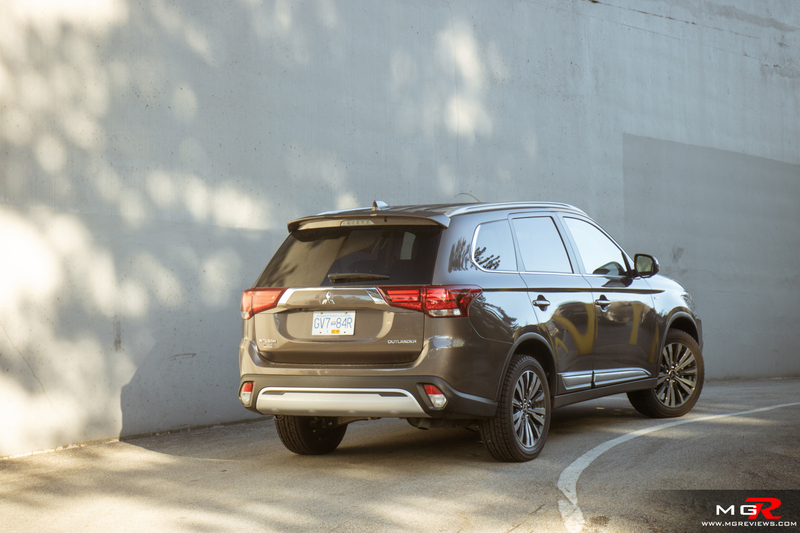 So make sure you find a comfortable position when test driving the Outlander. 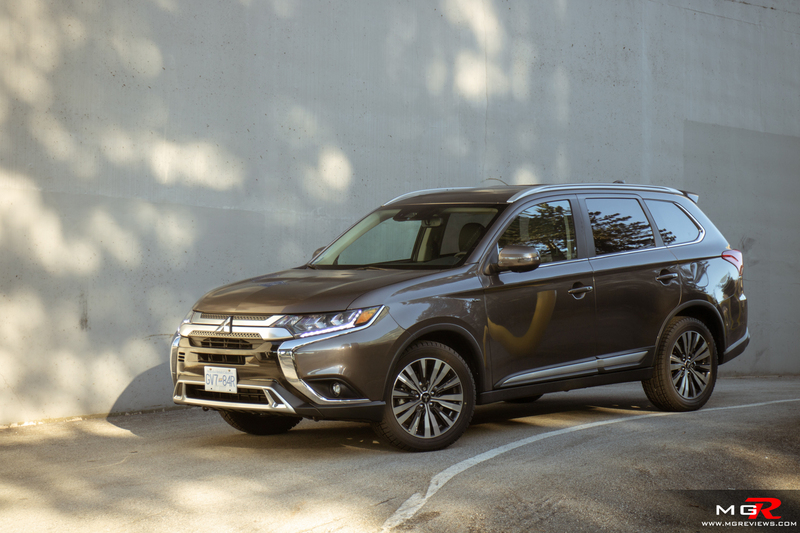 Noise, Vibration, & Harshness – Unfortunately the 2019 Mitsubishi Outlander GT does not do well in this category. There is a lot of wind and road noise that intrudes into the cabin. 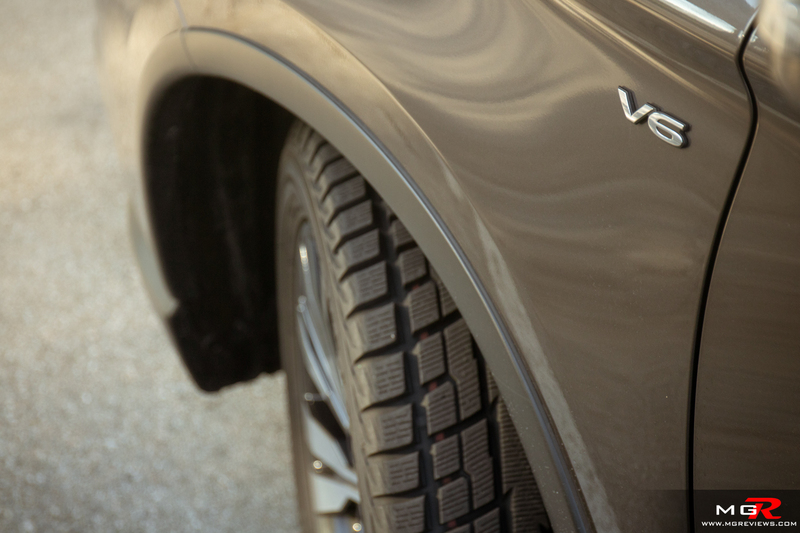 What’s worse is the noise made by the equipped all weather tires that have unusually deep tread blocks which make more noise than normal all season tires. 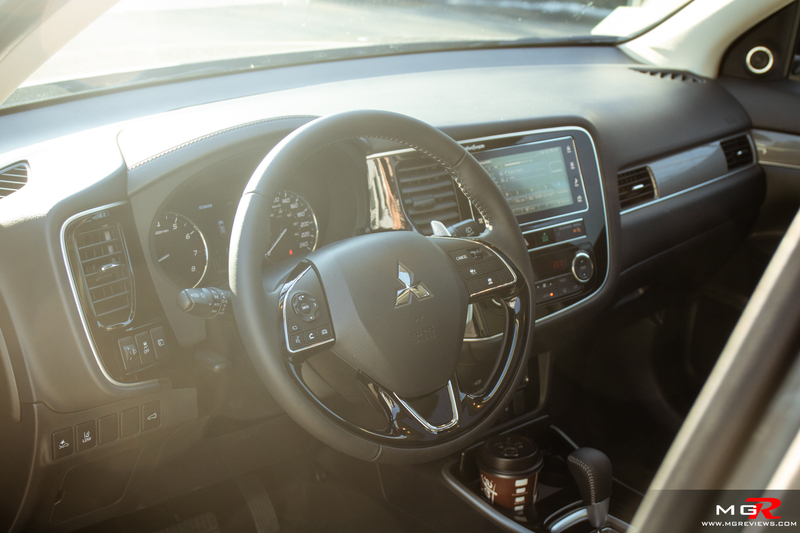 Also the Outlander suffers from the same squeaks as the Eclipse Cross especially on the steering wheel trim pieces as shown in the picture. 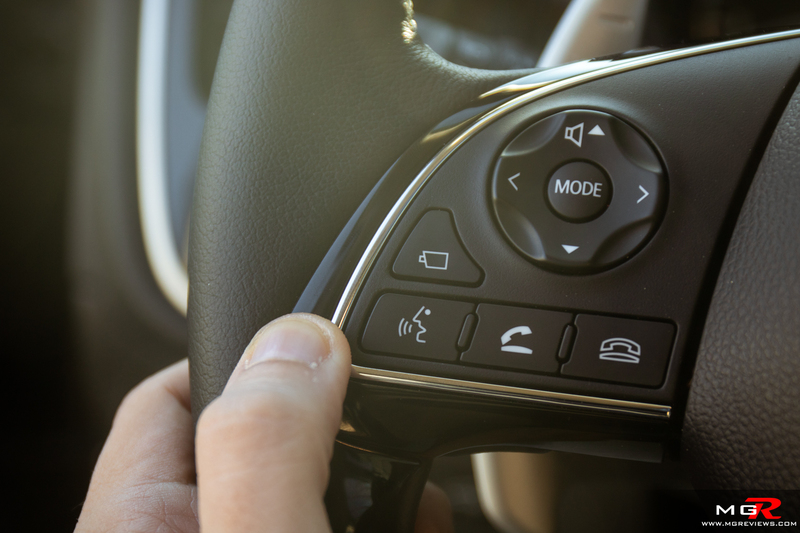 Most people always touch that particular part of the steering wheel and it becomes very annoying very quickly when it constantly squeaks. 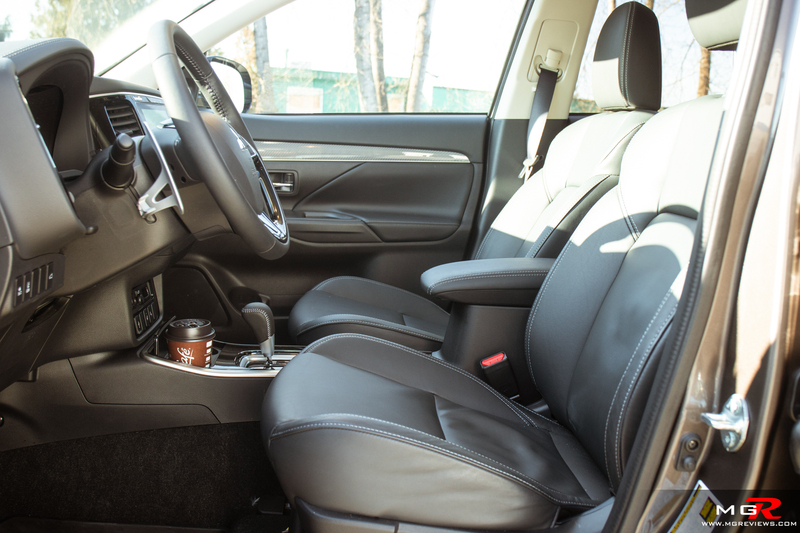 Interior Design – The interior look of the Outlander GT is a bit bland by today’s standards. Some of the switches are the same ones used in the Lancer from back in 2008. 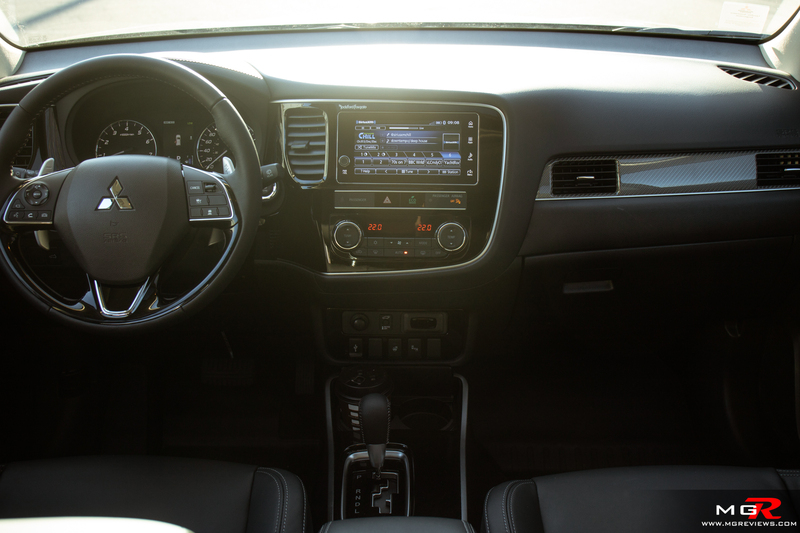 They work just fine but Hyundai, Honda, Mazda have all updated the look and feel of their SUV interiors drastically in the last decade. 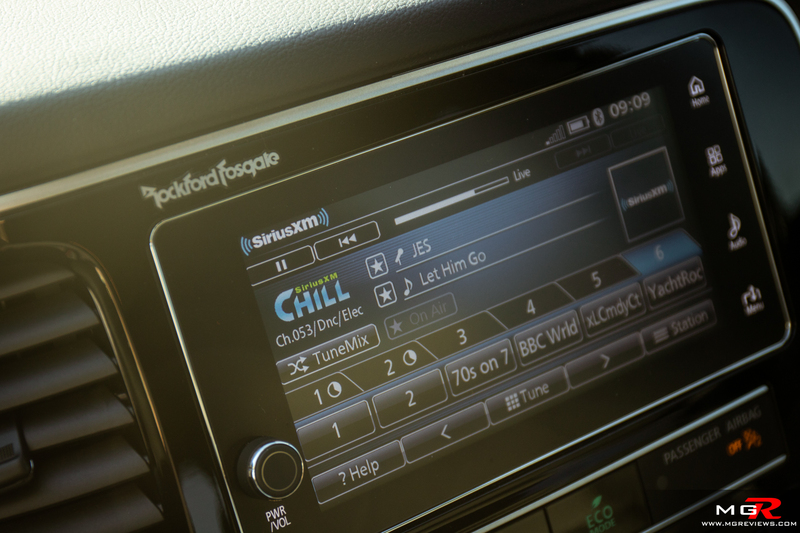 Gadgets – The infotainment system is relatively easy to get used to and it does support Apple CarPlay and Android Auto with the base Outlander trim. Going up through the 7 available trims, different gadgets are added such as 360 camera system, heated steering wheel, blind spot sensors, sunroof, and so on. However what is odd about the packaging of the trims is that the forward collision mitigation system is only available on this top GT trim. 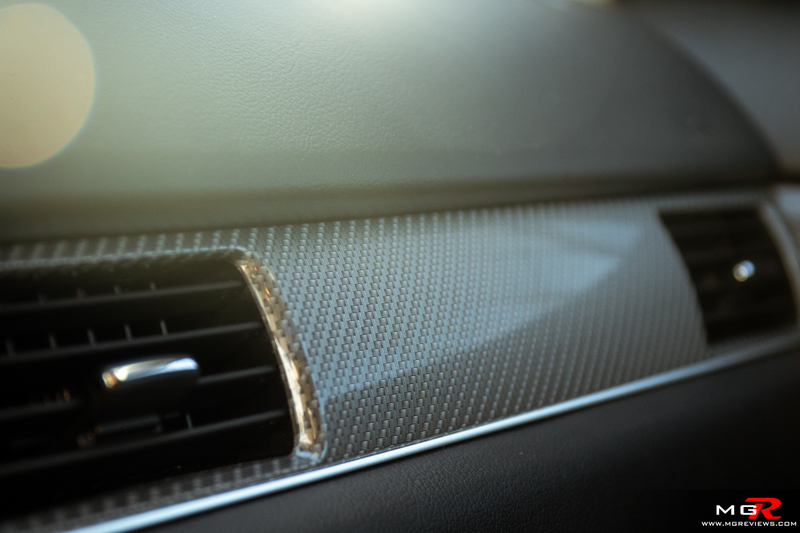 Most other manufacturers include this safety system in all or most trim levels. 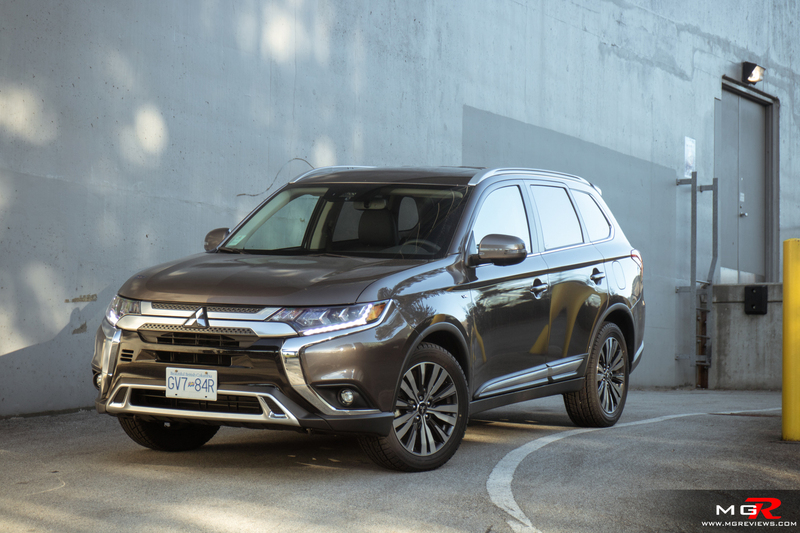 Exterior Design – For the 2019 model year, the Outlander received a few minor tweaks to the exterior design to make it more inline with other Mitsubishi SUVs like the Eclipse Cross. 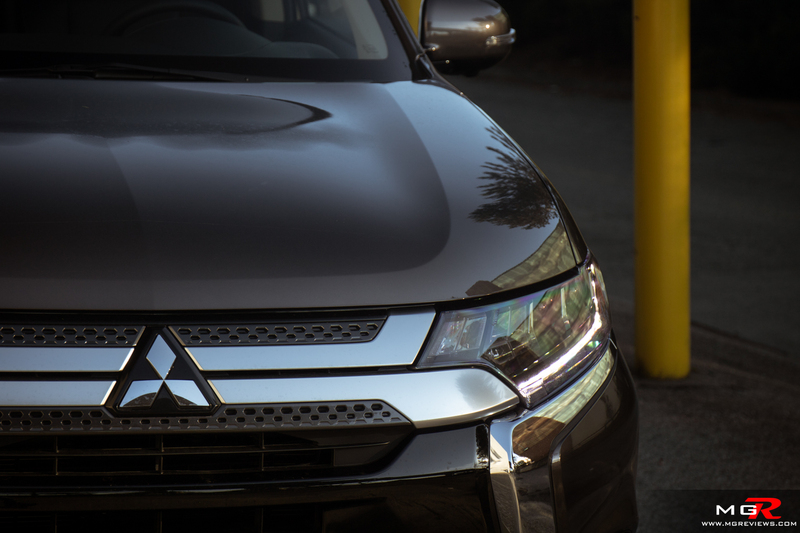 It features similar headlights and twin-chrome grille but thankfully the back doesn’t have the “Aztek” looking rear end that the Eclipse Cross has. It’s a bit more traditional. 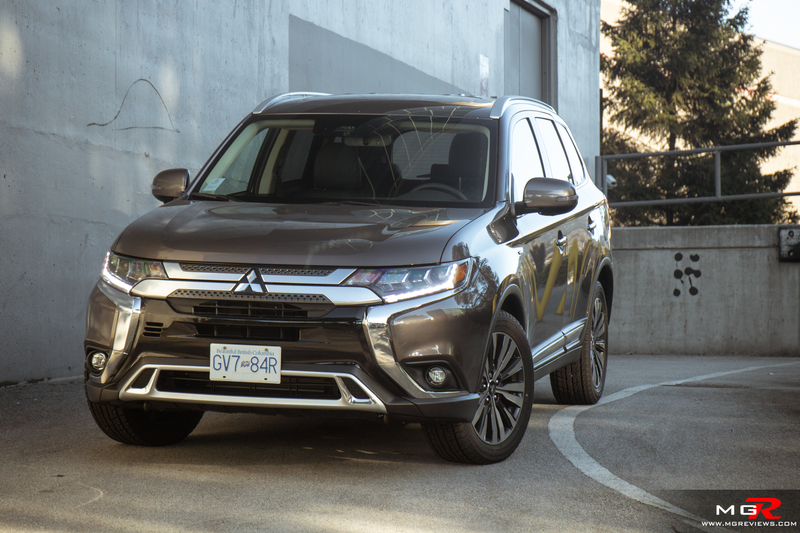 With a starting price of $29,298 CAD, the Mitsubishi Outlander is way cheaper than what Mazda and Honda have to offer as 3-row SUVs. The Hyundai Santa Fe XL and Ford Flex (they’re still making it??) are closer to the price of the Outlander but still more expensive. However that base price is with the 2.4L engine which is not recommended. Instead the V6 that is available on the SE trim and up at $32,498 CAD is the one to go for if you’re on a budget and still need a three-row SUV that is comfortable for daily use.